PowerSchool 7.2 has been released and includes/replaces several PDS customizations. Because of the changes to the Teacher portal there are several customizations that are not yet compatible with the new 7.2 features. Below is a list of customization that are no longer needed or are currently not compatible. Do you need to create drop downs so that your users enter information correctly? Do you want to also make it so that new options can be added to the dropdown without reprogramming the page again? Then dynamic dropdown is your solution. Created by Dean Dahlvang this customization makes it possible for you to add drop downs to all sorts of areas (cities, states, countries, etc) and gives you a way to have your users manage that drop down rather than having to update the page each time an option changes. Make your life easier by using this customization! With PowerSchool 5.2 the way Enroll Dates are determined for student’s classes has changed. By design when enrolling students in a class the first day that the class actually meets is the Enroll Date. Because of this the class counts show a 0 (zero) until the class actually starts. These sets of pages add the option to see the count of students in the class on any giving future day. The pages are also converted from tlist to SQL to help speed things up. NOT COMPATIBLE WITH PS 7.2. Download link has been removed until a updated version is available. PowerSchool 7.2 now includes Data Validation for the Students/Teachers tables. State reporting needs, among others, are rising. With them is an increased need for schools to rely on multiple sources of input for that state reporting. Problem is the more people who are involved in inputting the data the bigger the chance that things are going to get entered incorrectly. Pearson is starting to make things a little easier but its not quite enough yet. So we created a script you can use (and expand) to make things a little easier. A set of pages targeted to Admin’s and Teachers. Provides a “Daily Attendance” link when logged into a school who uses Daily Attendance. Will list all the students in the school who are absent and their bridge period comment if one exists. The Admin version has a link to identify who hasn’t taken attendance yet. The Teacher version includes a “My Schedule” link that lets the Teacher see their matrix schedule. Would you rather build a report in Report Works or a custom screen? 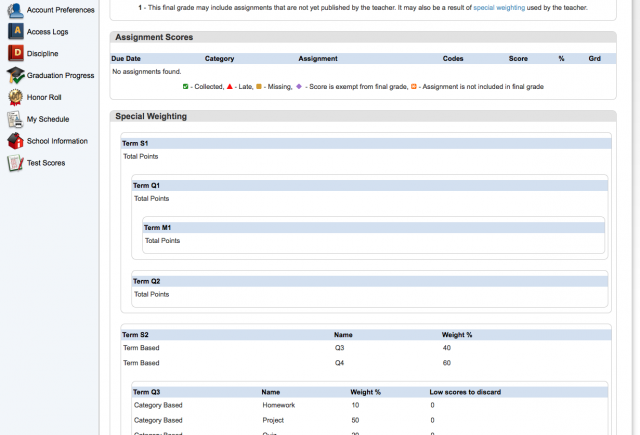 Read more about Would you rather build a report in Report Works or a custom screen? This customization is not compatible with PowerSchool 10.0/PowerTeacher Pro sections.